PHUKET: The International Surf Lifesaving Association has issued a resolution to formally request the US Department of State to issue a “Level Three Advisory” warning American tourists of the dangers of swimming in Phuket without trained lifeguards on the beaches. In a copy of the resolution obtained by The Phuket News, the ISLA resolution notes, “The Board of Directors of The International Surf Lifesaving Association requests that the United States Department of State issue a Level Three Travel Advisory advising US Citizens of the extreme danger that exists in the ocean waters surrounding Phuket, Thailand, and that no ocean lifeguard services are provided. WHEREAS: The PPAO has directed the Thai Army to prevent Phuket’s Internationally Certified Ocean Lifeguards from providing volunteer lifeguard protection at Phuket’s beaches, and therefore has no lifeguard protection in place. In the covering letter in the formal request, obtained by The Phuket News yesterday (Mar 23), ISLA President Henry Reyes, notes, “The southwest monsoon affects Phuket from May to November each year. This yearly weather phenomenon creates strong winds and waves, which in turn create a special type of deadly rip current, the ‘flash rip’. “Worse, ocean conditions unique to the region make Phuket’s flash rip currents some of the most dangerous in the world. Nicknamed the “Phuket Cocktail” in a study by a Phuket University researcher, Phuket’s flash rips appear on the beach suddenly, move unpredictably, and then disappear. 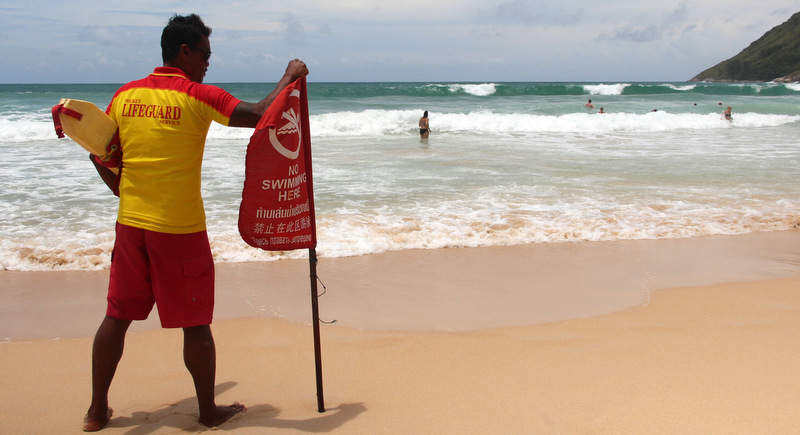 Daren Jenner, ISLA’s Warrant Marine Safety Officer - Phuket Specialist, told The Phuket News that serious concerns also have been raised over the quick and quiet appointment of Bangkok-based Consultancy LP Laikhum Co Ltd to provide lifeguards at Phuket’s beaches. LP Laikhum Co Ltd was quietly appointed a B13-million government contract to provide a total of 98 lifeguards on Phuket beaches from Mar 1 through Sept 30, thus offering no beach lifeguard protection for tourists during the deadly month of October, when the southwestern monsoon whips up dangerous surf along Phuket’s west coast. News of the appointment was posted on the PPAO website on Feb 28, but the contract came into effect the next day, Mar 1. “The company that has reportedly ‘won’ the seven-month lifeguard contract, LP Laikhum, was a previous provider of ocean lifeguard services in Phuket for just one year, and was ousted for alleged mismanagement of funds,” Mr Jenner told The Phuket News. “Allegations came from both sides, but numerous lifeguards report they were consistently late in paying the lifeguards’ salaries,” he added. “Conditions on Phuket’s beaches have also dramatically changed since Laikhum’s failed one-year stint in Phuket. Tourist arrivals and corresponding beach attendance have doubled since then, but the number of lifeguards proposed in the new contract remains the same as seven years ago. This is woefully inadequate for the current numbers of beach visitors,” Mr Jenner explained. “In addition, much of the increase in arrivals occurs during the monsoon (low) season, when ocean conditions are much more dangerous,” he said. LP Laikhum is unlikely to acquire the services of trained lifeguards in Phuket, Mr Jenner noted. “At this stage, over 200 ocean lifeguards recently trained to international standards, many of whom were drafted from the ranks of the existing local lifeguards, have already pledged their commitment to another company. At this time LP Laikhum has no certified ocean lifeguards willing to work for them,” he said. The company that has drafted a plan to extend lifeguard coverage at Phuket beaches – and to which the lifeguards have pledged their commitment to – is Baan Natacha Co Ltd, Mr Jenner explained. “This company has submitted a plan for: 220 lifeguards, increased lifeguards at beaches with existing coverage, lifeguard coverage on additional beaches which are not staffed now, vehicles, radios, lifeguard towers, and so on,” he said. “As such, the budget offered by the PPAO is insufficient to implement this plan,” Mr Jenner pointed out. Regarding Army military personnel last week “asking” volunteer lifeguards to no longer patrol at Kamala Beach (see story here), Mr Jenner noted, “This is a morally outrageous act that demonstrates the PPAO’s wanton lack of competency in administering ocean lifeguard services on Phuket. “Put simply, lifeguards qualified to rescue swimmers in Phuket’s dangerous waters can’t be created out of thin air. That experiment already failed with the Governor’s appointment of ‘Beach Safety Teams’ in 2017, consisting of unqualified personnel, who in the end wound up needing rescue themselves. “The International Surf Lifesaving Association, the largest and most recognized water safety organisation in the world, is pressing forward with a resolution to the US Department of State requesting the issue of an official travel advisory, due to the absence of qualified lifeguards on Phuket’s beaches. “The ISLA’s request asks that the Travel Advisory remain in place until Phuket's beaches are staffed with qualified, certified lifeguards, who are able to provide services that meet the international standard,” Mr Jenner said. This is silly. When we grew up we went in the sea, in the surf with no lifeguards. We  looked at the conditions and made up our own mind. We know if we can swim and if the sea is safe to swim. However, being a tourist resort where many nannie states come with many people that cant work out that the sea is unsafe to poor swimmers, they ARE needed. Why they were removed to start with is beyond me. Very good, that request US level-3 Travel Advisory Warning! Looks like the sh#t is about to hit the fan. Only in Thailand could something so easy be made into such a farce. Just shows the affect of the “me me me” mentality.